A tripod is used to hold a camera stationary in one place. In other words, it is a supporting structure for a camera. Tripods are used in most types of photography at one time or another. 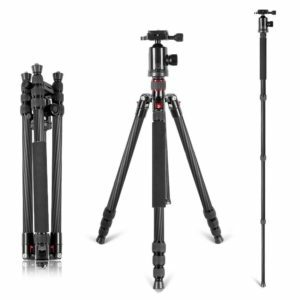 If you go online and search the e-commerce websites like Amazon, you will find that there are hundreds of tripods available in various shapes, sizes and, colors. So many tripods to choose from. But is one better than the other? Obviously, there might be some that are significantly better than others. There will be some that are more expensive and some that are awkwardly shaped. However, the reason behind so many tripods in the market is that one tripod does not fit all camera needs. They all might look exactly the same but they are used for different reasons. 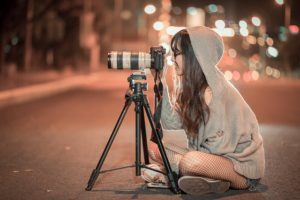 A tripod is one of the first DSLR accessories that a you will need when getting started.Since there are plenty of tripods being sold online it can be confusing to choose one. 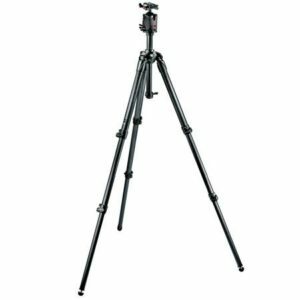 For your assistance, we have sifted through the majority of the tripods found online and selected five best ones varying in size and price, so you can make sure you get the best quality product. 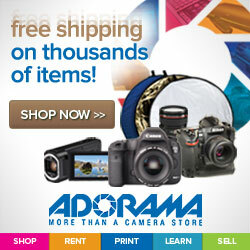 The AmazonBasics is a great choice for beginning photographers. It is a 60-inch tripod so it is tall enough to satisfy all your photographing needs. The tripod’s height is easily adjustable. All you have to do is open up its collapsible columns and adjust the height based on your preferences. This feature is especially useful for you if you are a regular portrait photographer, because you have to photograph people with different angles, people who are short and people who are tall. Therefore, having a versatile tripod always comes in handy. Tripods are needed to keep a camera stationary in low-light situations and that is what this tripod does the best. 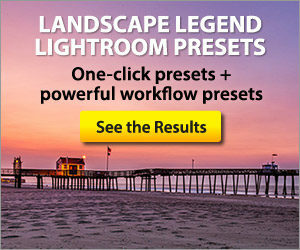 Another use is landscape photography where long exposures are used for waterfalls or sunsets. Thanks to its sturdy rubber feet, the tripod holds still on all kinds of surfaces including marble and ceramic tiles that are usually very slippery. To top it all off, this tripod is compatible with 90% of the cameras and camcorders available in the market. 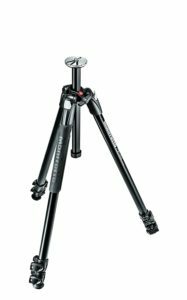 The Manfrotto 057 is a tripod made for professionals. Its $900 price tag is an indicator that this tripod means business. The Manfrotto tripod is forged from magnesium and carbon fiber materials which makes it strong and lightweight at the same time. Two of the most important tripod traits for a professional photographer. 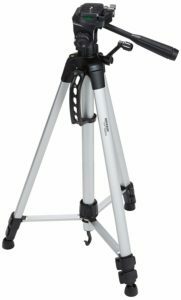 The lightweight allows you to take the tripod anywhere without worrying about carrying a lot of weight and the sturdy construction allows you to attach telephoto lenses to the camera without fear of the tripod falling. Furthermore, you get a Q5 pro ball head which allows you to effortlessly move the camera in almost all directions without any jitters. If you are really taking things to the next level, this tripod should be part of your arsenal. If you know Manfrotto you would know that they make very high-quality tripods that are usually tailor-made for professional photographers. We already reviewed a high-end tripod by Manfrotto, which is so expensive that it can be out of reach for most of you. The Manfrotto 290 Xtra on the other hand, is cheaper and also built strong. The tripod frame is made of aluminum, which allows the tripod to be extremely light-weight. Rubber and plastic are used in other places to complete the look. The rubber feet are especially a great addition in the design since they are integral in providing stability and support on slippery surfaces. You also get a ball head that allows you to frame a shot with extreme ease and make smooth videos. If you are looking for a lightweight and strong tripod, you have come to the right place. The Neewer Carbon Fiber tripod is an extremely customizable tripod, meaning you not only have height but you can adjust the camera position as well. Other than that, you get a 360-degree ball head that allows you to move the camera in all directions smoothly. This is a great feature for videographers who are always looking for affordable yet strong tripods/monopods. A special feature that comes with this tripod is that it can also be used as a monopod. All of these special features come at a very affordable price, so if you are a struggling photographer, the Neewer tripod might just be the breakthrough you need to make your photography better. A very interesting and practical version of a tripod is a gorilla tripod. This is because this tripod has very adaptable legs. You can twist it legs from anywhere in any direction. But why would you do that? Gorilla tripods were made to aid adventure and wildlife photographers. Tripods are great for flat surfaces but you will not always get a flat and stable surface and that’s why adaptable gorilla tripods are used. You can twist any of its three legs to fit the terrain and ensure stability. 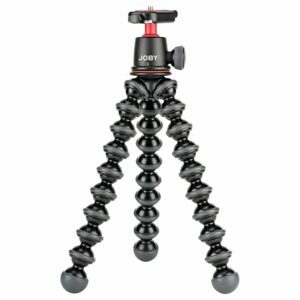 The JOBY GorillaPod 3K Kit is one such great tripod that is made of only the strongest materials. The rings and foot of the tripod are fitted with rubber to ensure stability while you shoot in challenging terrains. The legs are flexible enough that they can even be wrapped around a tree branch or railing. Given all these advantages why shouldn’t you use a gorilla tripod all the time instead of a regular tripod? That’s because a gorilla tripod is not very tall, so you can only use it in limited situations. If you do not feel the ball head, the JOBY is also available as just the stand. You can see there are a lot of options when choosing a tripod. This article covers some of the options to consider when shopping for your tripod. Things to consider include, do you need a ball head? Are you shooting portraits or landscapes? Will you been in situations where a standard tripod cannot be used? Whatever type of photography you do, you will likely find a time when you need a tripod. Consider the options and the advantages.